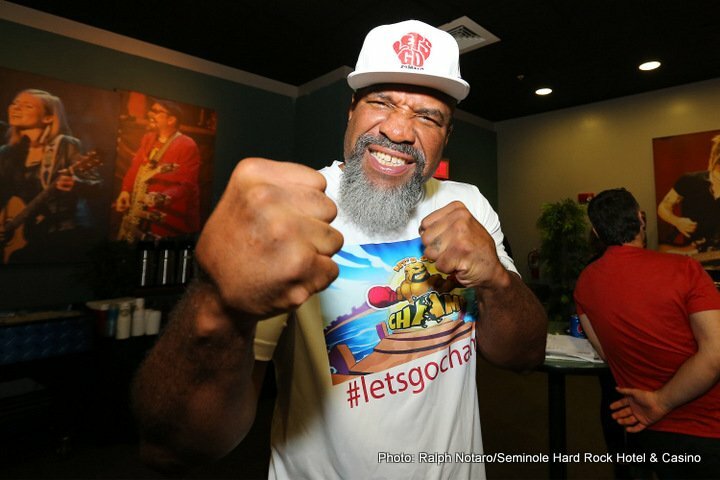 Shannon Briggs has revealed that he plans on making a comeback in 2018 following a drug suspension. The 46-year-old Briggs has been out of the ring for a year and a half since stopping Emilio Ezquiel Zarate on May 21, 2016. Briggs just turned 46, and he wants to make up for lost time by staying active to make a run at a heavyweight world title shot. If Briggs is successful at capturing a world title, it would break George Foreman’s record of being the oldest fighter to capture a heavyweight world title. Foreman became a 2-time world champion at the age of 45 in stopping Michael Moorer. It’s going to be a little more difficult for Briggs to accomplish his goal of breaking the record, as he’s not been active the way Foreman was when captured a heavyweight world title at 45. There isn’t a vulnerable heavyweight world champion for Briggs to go after like there was when Foreman won his world title in his 40s. Moorer was a former light heavyweight champion that moved up to heavyweight and beat the undersized Evander Holyfield in 1994 to capture the IBF and WBA world titles. Briggs tested positive for testosterone last year. He was subsequently given a 6-month doping ban from the sport. Before that, Briggs supposed to fight for the WBA ‘regular’ heavyweight belt against 43-year-old Fres Oquendo. It was an ideal situation for Briggs to win a world title, as Oquendo hasn’t fought since 2014. Briggs went Foreman into retirement by beating him by a controversial 12 round majority decision on November 22, 1997. For many boxing fans that saw the fight, they felt that Foreman had been robbed. That was NOT a world title fight, however. Foreman had been stripped of his WBA title in March of 1995, and he vacated his IBF belt in June of 1995. Briggs pulled off a big upset in defeating WBO heavyweight champion Siarhei Liakhovich by a 12th round knockout in 2006. Going into round 12, Briggs was behind on all 3 of the judges’ scorecards. He went after Liakhovich was able to hurt and score the knockout. Unfortunately for Briggs, he was easily beaten by Sultan Ibragimov in his first defense of his WBO title in losing a one-sided 12 round unanimous decision.